We’re lucky that Justine is willing to share her many talents and adventures with DIY Del Ray. We’ve done an art tour in her home, featured her pour over coffee bar at the Four Mile Run farmers’ market, and learned all about seed saving in a demo she led last August. 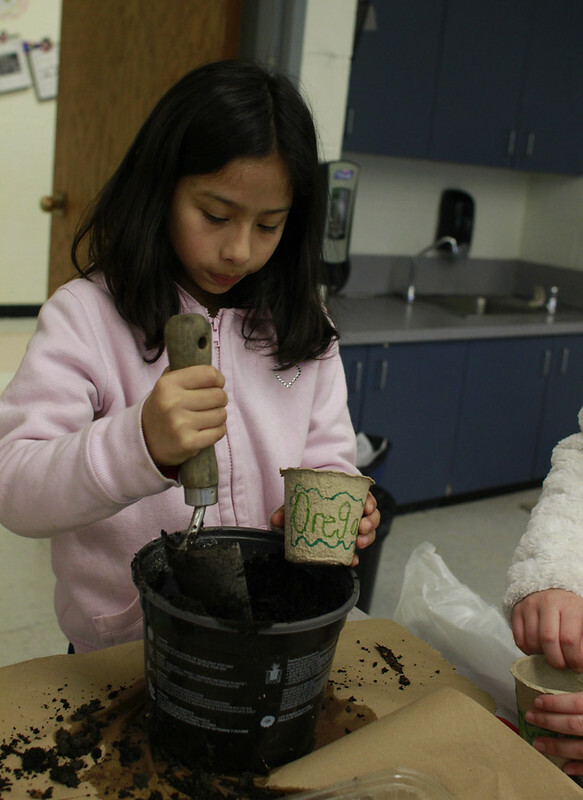 Justine is a teacher at Mount Vernon Community School, where she leads an after-school gardening and environmental learning club. 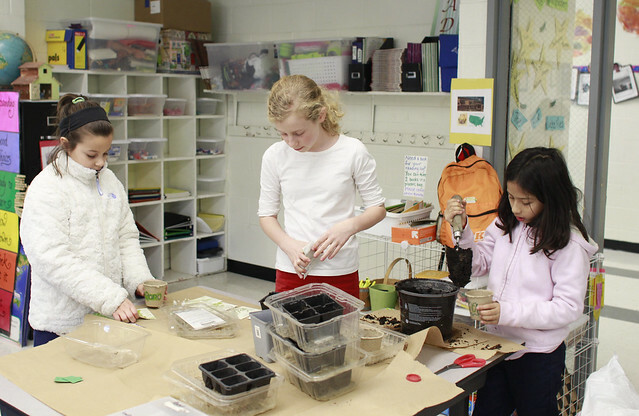 She and her students are busy even in these frigid winter months doing, as she puts it, “projects to green up” the indoors. 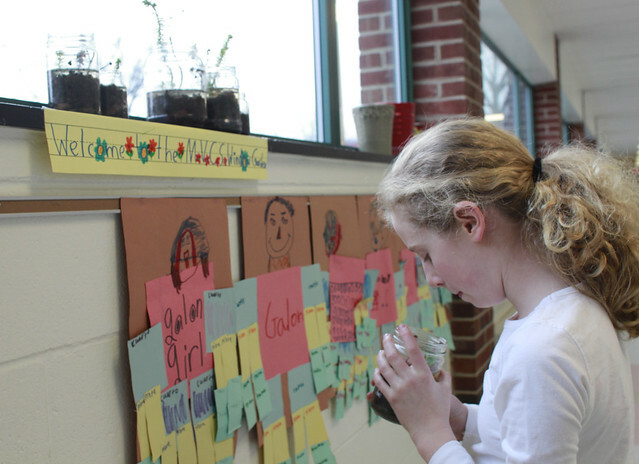 Today, illustrated with her own photos, Justine tells about her indoor gardening projects both in her own home and with the school garden club. I can’t stand not gardening, so I always enjoy creating an indoor garden during the wintertime. Every year, I experiment and add a new plants to my repertoire. All you need is a window with sunlight to have an indoor garden, so even apartment dwellers or people without a garden can satisfy their green thumb. 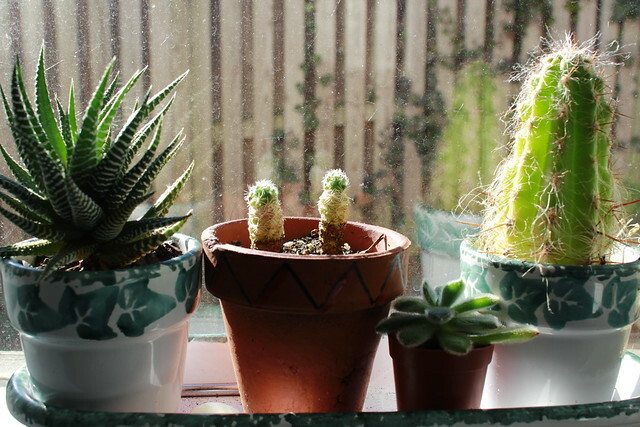 Succulents can stay in your garden window year round. This year, my aunt gave me a paper white set. A no-brainer project, the gift included a lovely window pot, soil, and the paper white bulbs. 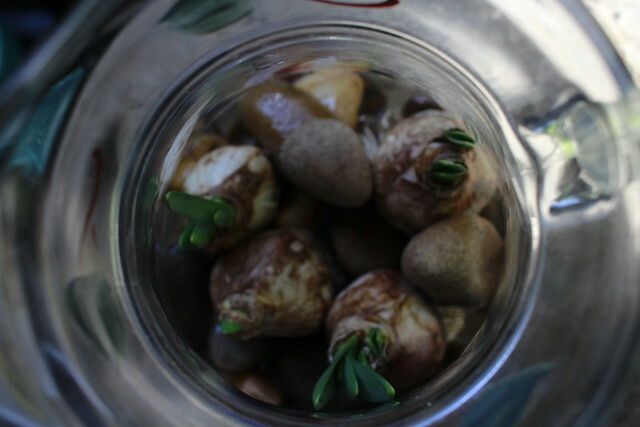 I simply added the bulbs to the soil and watched them grow in my kitchen window. I planted them the Sunday after Thanksgiving and had beautiful blooms by Christmas. They filled my kitchen with their sweet fragrance throughout the holidays! Next year, I plan on purchasing more of these bulbs to plant throughout the house. I will scatter my plantings so that I will have blooms throughout the winter. 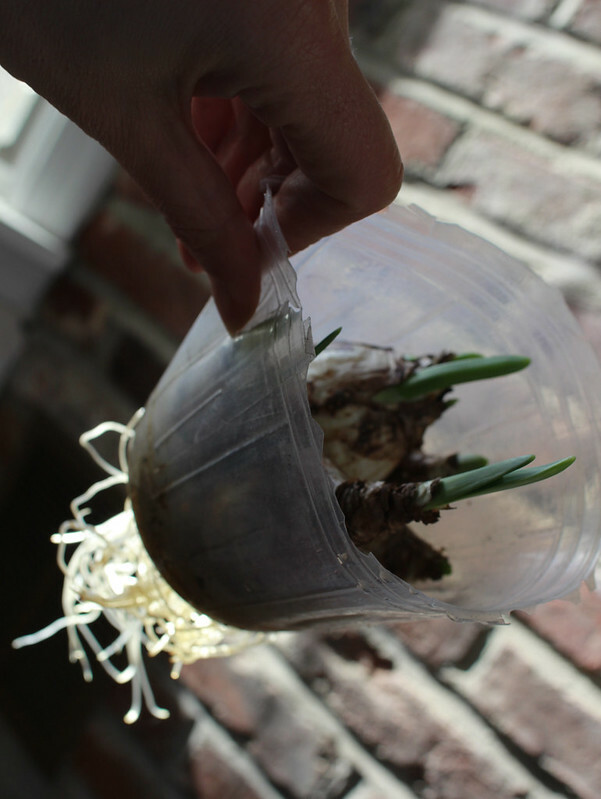 You can also plant daffodil bulbs in a vase or pretty pot inside. This year, I had some leftover daffodil bulbs from my fall planting, so I decided to plant some of the extra bulbs indoors. I planted one in a plastic pot sitting in another pot (allowing drainage). 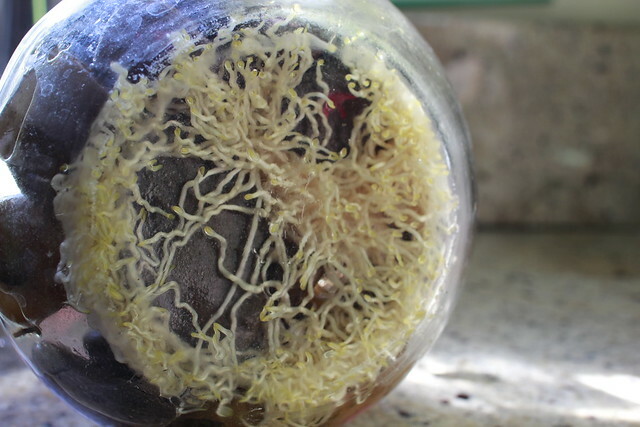 The bulbs developed incredible roots that can reach the water that sits at the bottom of the pot. I also put some daffodil bulbs in a glass pitcher with rocks at the bottom for drainage. I wanted to see which method would work better. Only time will tell…. I learned through research that it is better to plant indoor bulbs in soil, so that the following year, you can plant them in the garden. 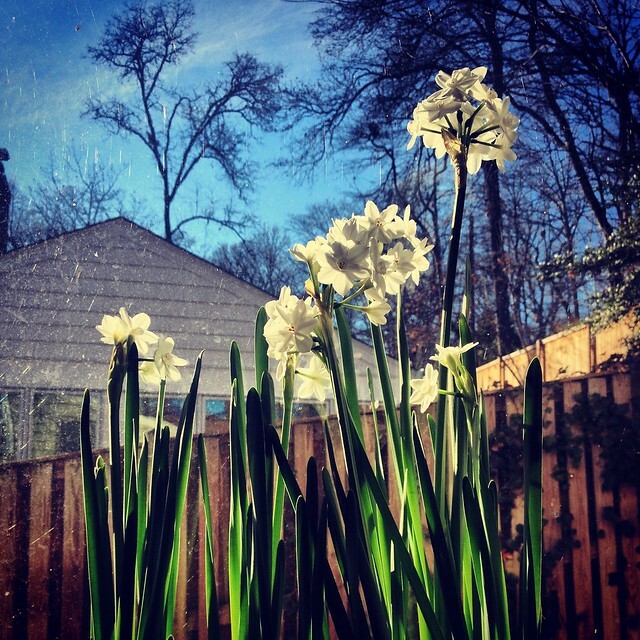 Without soil, the bulbs deplete all their nutrients. But it’s fun to plant them without soil so you can observe the roots. 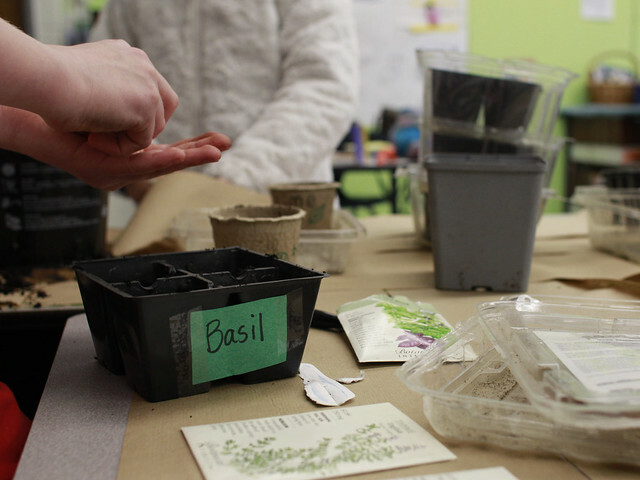 To start your herb garden inside, you can begin with seeds in late January to mid-February. 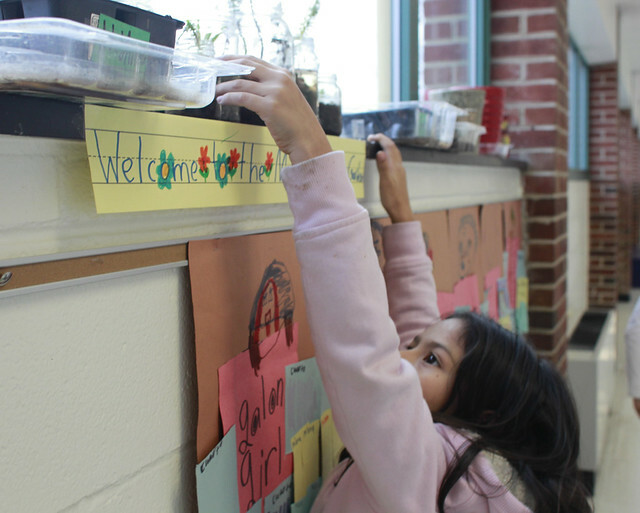 I started the school’s herb garden in a sunny window with my after-school club. The students did all the work, I just supplied the soil, seeds, pots, and trays. I like to start basil this way. I also have an oregano plant I originally started in my window. Now that it’s established, it does just fine outside year-round. You can also start butterfly weed, marigold, and zinnias inside. Giving them a head start when spring comes! We reuse old plastic lettuce boxes for our trays. A tray is very important, allowing the plant to save excess water and draw it up when it gets thirsty. Another activity I did with my after-school club was to make recycled glass jar terrariums. 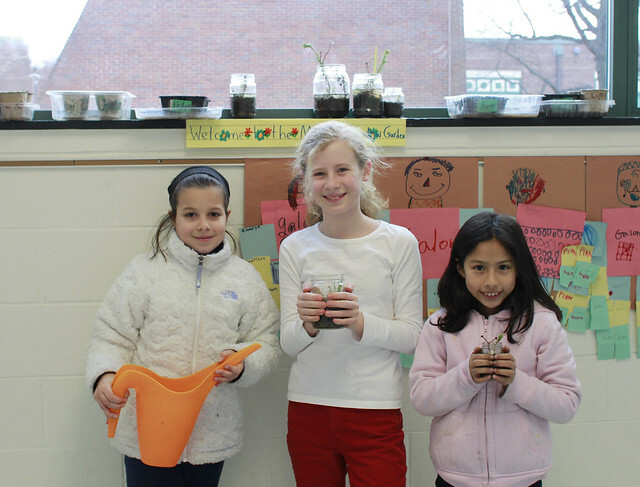 We collected succulent cuttings from the green roof garden in the school’s courtyard. These plants have spread so much, it is easy to pull out a small one for replanting. Then, we added rocks to the bottom or top of a recycled glass jar and arranged the plants to our liking. Finally, we put them in our sunny window garden where we have been tending to them. Every year, I like to try something new as well. This year, it will be sweet potatoes, starting by creating the “slips” indoors and following these instructions. We look forward to hearing how Justine’s experiment turns out!